Donald Trump is bringing America government by the worst men. Donald Trump’s appointees represent a coherent ideology and perspective, one that should terrify all Americans. Steve Bannon, Michael Flynn, and Jeff Sessions. Photo illustration by Slate. Images by Mandel Ngan/Getty Images, Eduardo Munoz Alvarez/Getty Images, and Alex Wong/Getty Images. What would it look like to live under a kakistocracy, Greek for “government by the worst men”? You would have grifters and cronies and unqualified loyalists, but what else? What does it mean for someone to be the worst, and what does it mean for those people to have the reins of power? After this presidential transition, we are going to find out. Throughout his campaign, Donald Trump said he would hire “the best people” to staff his administration. If “best people” means experienced politicians, dedicated experts, or even skilled businesspeople, then he’s stretching the truth. Few people with those qualifications are on board for an appointment to the Trump White House. But if “best people” means the hangers-on of the Trump campaign—the white nationalists, petty authoritarians, and conspiracy-mongers—then we’re on target. Here, so far, is whom we have on the table. We have Stephen Bannon, the former head of Breitbart known for his open ties to white supremacists, anti-Semites, and foreign reactionaries in France and Russia. Bannon is a Svengali of sorts for the ugliest forces in American and international politics, a man who believes the Western world is in a fundamental struggle with Islam and who sees multiculturalism and liberal openness as a threat to the future of the West. As of this moment, he is chief strategist to President-elect Trump, with an office in the West Wing. The Washington Post gives a glimpse of what this might mean, in a story describing Bannon’s role in moving Trump toward anti-Muslim policies and a larger ethnocentric vision. Chief strategist Bannon is joined by retired Lt. Gen. Michael Flynn, whom Trump has reportedly offered the job of national security adviser. On one hand, Flynn has a long and decorated career in military intelligence. On the other, his public statements reveal a conspiratorial mind, anti-Muslim beliefs, and a tolerance for anti-Semitism. And indeed, the Washington Post reports he was removed from his position as director of the Defense Intelligence Agency for fostering a “destructive climate.” Flynn has backed Trump on the renewed use of torture and refuses to rule out targeted killings of the families of suspected terrorists. He has stated, on Twitter, that “fear of Muslims is rational” and has peddled fake news, conspiracy theories, and anti-Jewish warnings. There’s also the fact that when Flynn began receiving classified national security briefings as part of the Trump team, he was also working as an intelligence consultant for international clients, including a Dutch company owned by a wealthy Turkish businessman with ties to Turkey’s autocratic President Recep Tayyip Erdogan. What makes this more alarming, in terms of tolerance for autocracy, is Flynn’s friendliness with Russia. He’s been criticized for appearing on Russian state-controlled media and for attending a dinner with Vladimir Putin in Moscow. And, it should be said, Flynn’s son (who is also his father’s chief of staff) has also pushed conspiracy theories and racist memes on social media. In recent years, Sessions has been an advocate for strict immigration laws and other “tough on crime” measures. Earlier this year, he cited Trump’s 1989 advertisement calling for the execution of the Central Park Five as evidence of the president-elect’s commitment to “law and order.” He has also denied the existence of voter suppression in his state, arguing instead—like many Republicans—that there is an epidemic of voter fraud. Sessions, who was too contemptuous of civil rights groups and black Americans to be confirmed as a federal judge by a panel of Republican senators in the 1980s, is poised to lead an agency tasked with defending the civil rights of millions of nonwhite citizens—an agency founded, in part, to combat the Ku Klux Klan in the Reconstruction South. If confirmed, Sessions will be tasked with defending voting rights; investigating rogue police departments like the one in Ferguson, Missouri; and pushing standards that ensure fair treatment for all Americans, regardless of background. It’s possible that Sessions would take up the mission of the DOJ and its Civil Rights Division. But given his history, the likely outcome is the reverse. Under Sessions, the Civil Rights Division would likely wither and die. And in the absence of federal oversight, states would pass voter suppression and disenfranchisement laws with impunity. Conservative lawmakers in Wisconsin, North Carolina, and Texas—all scrutinized by Eric Holder’s and Loretta Lynch’s DOJ—are surely salivating. Now, let’s step back and look at the big picture. Thus far, to staff his administration, Trump has chosen a white nationalist provocateur; an anti-Muslim conspiracy-monger; and an apologist for a regressive, anti-black politics (and this is before we get to potential appointee Rudy Giuliani, who embodies many of Flynn’s and Sessions’ worst qualities). These are “the worst people,” yes. But they also represent a coherent ideology and perspective: white nationalism. The thread that ties Bannon’s alt-right advocacy to Flynn’s clash-of-civilizations worldview to Sessions’ skeptical eye toward civil rights enforcement is a belief in the political and cultural dominance of white Americans. Their America isn’t a tapestry or a melting pot; it is simply white. 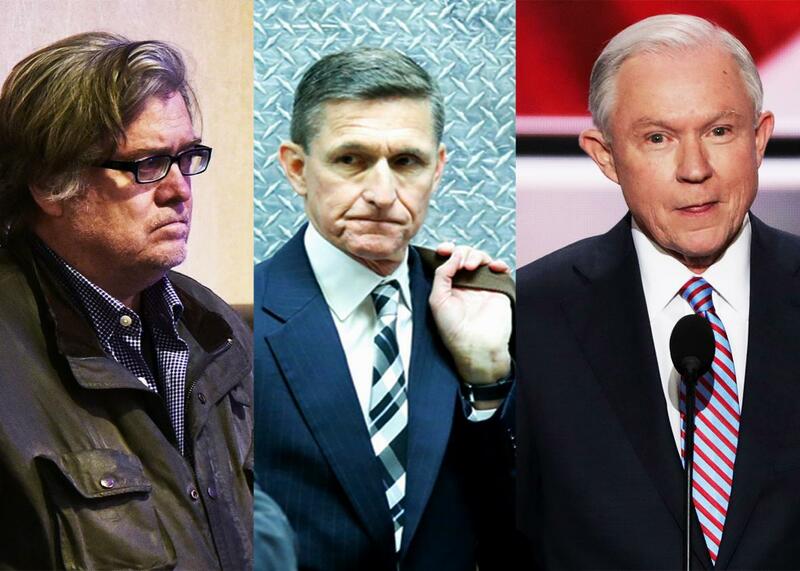 Judging from the presence of men such as Bannon and Sessions, we should expect a Trump administration to roll back any progress this country has made toward inclusion and participation. We should also expect it to empower states to pursue discriminatory policy on voting, to empower local police departments to operate with impunity against communities of color, and to empower those who see Muslims—citizens or otherwise—as threats to contain or eliminate. As we step into this world—as we enter the age of kakistocracy—we should remember one thing. This isn’t a departure from Trump’s populism. It’s the foundation of it. This is what Trump campaigned on. It’s what he promised. And millions of Americans either wanted it or were willing to look past it. For the targets and victims of Trump’s administration, there’s not much of a difference there. Whether his voters wanted this or didn’t, Trumpism is what they’ve wrought and what America will have to reckon with for generations to come.